American artist Sandow Birk is an expert in restaging art from the past while injecting a contemporary twist to highlight socio-political issues. Highly intricate and vivid in color, Birk’s works are present in a diverse array of media. After a hiatus, the artist has returned to painting to create a new body of work for a solo exhibition at P.P.O.W. Gallery in New York City. 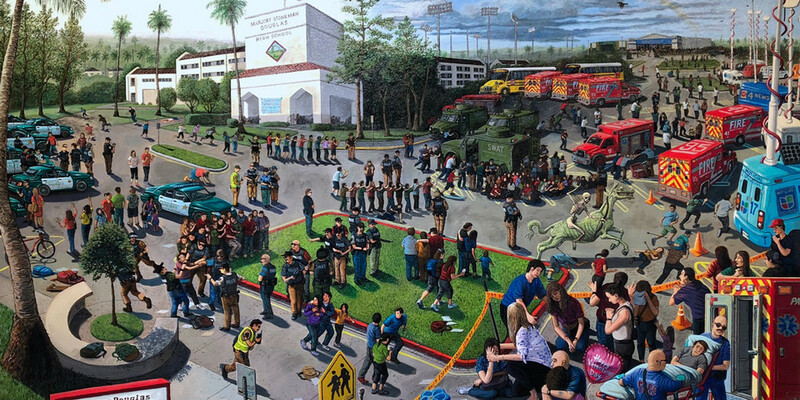 Entitled “Triumph of Hate,” the series spotlights apocalyptic scenes of real-life occurrences that have taken place in American culture, as per the gallery. Subjects include: “the 2017 school shooting at Stonemason Douglas High School in Parkland, Florida; the 2017 mass shooting at the Route 91 Harvest Festival in Las Vegas; and the white supremacists’ march in Charlottesville, Virginia; among other events,” the gallery added. Collectively, the exhibition will display all-new paintings, woodblock prints, and lithographs that reference the aforementioned events.